We grow some Cavendish bananas in a small area in the back garden and the biggest plant eventually produced a good-sized bunch of bananas. The bunch was nearly ready to pick when all the hands disappeared off the main stalk. There were no skins or any bits of fruit left on the ground. There was a small mound of kanagaroo poo! 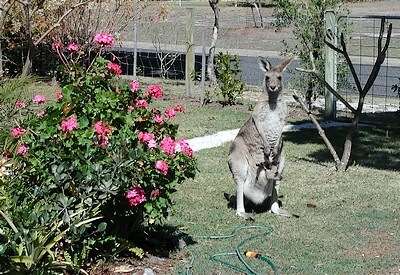 We didn't believe that the roos would eat bananas, until my wife was approached by one while she was eating a banana. She offered some to the roo who eagerly ate it and was looking for more. So there you go. Our kangas are the standard eastern greys, and as I live at Woodgate Beach, we have at least two females that are always with joeys that use the shade provided by our shrubs and trees. Also, the bananas that they ate were on a very small stem. I also think that at the time local grass stocks were dying from the drought so they moved closer to both the bananas and my vege patch, where they proceded to eat my silver beet to the ground. I don't mind as they were here before us. Our dog is an old border collie that we have trained not to chase them so they often tip toe past her while she is asleep and drink out of her water bucket!